I’ve got a problem – I REALLY like using my iPad as my digital sheet music BUT I also REALLY like using my iPad as an Instrument while performing! The problem comes in when I want to change sounds on my instrument app but don’t want to be flipping between apps during performance! The Solution – Use ForScore‘s ability to send program changes. UnRealBook also does this. One other slight hiccup in the solution is that not all instrument apps make it easy to figure out which program changes to send. Actually some apps just don’t respond to program changes. In FACT one app makes it SEEM like you should be able to send program changes but the app does NOT respond accurately! So, in order to save you some time until KV331 gets THAT issue fixed don’t bother messing around with program changes in their SynthMaster Player app. The app will respond to Program Changes but you will have to guess the correct PC to send as the ones listed are NOT correct! ForScore and UnRealBook are super easy apps to make this happen in. This is just as easy using one iPad if your iPad CPU is capable of handling the load of running ForScore and an instrument app. Which means you are probably going to be able to do this just fine. 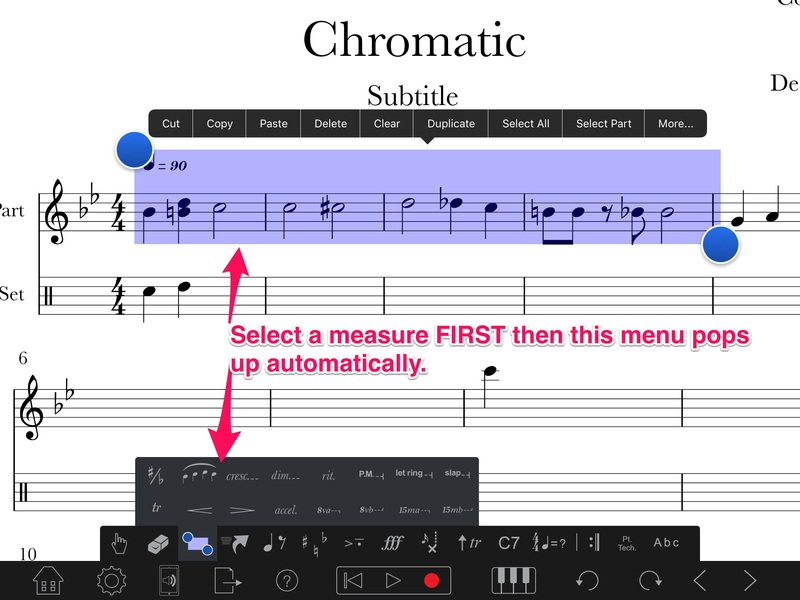 The instrument apps will be what gives you crackles and pops if your iPad isn’t new enough but seriously…. this trick isn’t that CPU intensive. Now…. if you have TWO iPads it is fun to see the changes happen real time! In Korg Module you have to put the sounds you want to use in their SetList feature. Then subtract 1 from the number next the sound you want to use and send that as the Program Change. So in the screenshot below If I wanted to select KAPhysical Model like I do in the video then I have to send a PC of 1. So then with THAT knowledge head over to ForScore, add a Button from the toolbox, choose the MIDI Action, Hit the + Button and select Program Change. In the screenshot below you can see where I have setup four instrument apps to receive Program Changes when I hit this one button. Tap the Done button and it’s time for the magic! Tap the blue Button and boom…. all four apps are now on the correct sounds! The beauty of all of this is that you can set up as many of these buttons as you would like. So it’s not going to automatically send the PC info until you hit the button. There is no rule for which app to put on which channel but it sure helps if you make up your own rules. My four main apps I am using currently are More Module Ch2, AudioKit Digital D1 Ch3, AudioKit SynthOne Ch4, Korg iM1 Ch5. If I keep using the same channels for these apps it becomes habit. Now…. If you have only one controller and it is a basic controller that does not allow for layers and splits or even changing of the MIDI channel then you will be using one app on one channel. If you want greater flexibility then check out my previous YouTube video about KeyStage. It is an awesome app for live performance with your keyboard! Oh man…so many apps and music things on sale this week! AirTurn Pedals, iPad Holders, and Stands are all 20% off! PreSonus Notion is 50% off as is StudioOne for the desktop. No iOS sale yet. Below is a collection of apps that I have found to be amazing music performance apps/music education apps. All high quality and now is a great time to purchase! Wizibel – Add some sweet effects to music videos. Using Notion in place of non-available Musicians! I have been an extremely busy bee the past couple months working hard on a project here at the school. I’d like to share just a bit. I’ve learned a ton about using Notion software, by PreSonus, to fill in for musicians that just are not available. You see we are a small school district with limited funds and limited access to amazing musicians who are able to cover all the possible different instruments we might want to utilize in a particular production. We just are not able to produce an entire orchestra, including harpist! So I set out to see if it was possible to make do by using the nTempo feature in Notion. Through a long process of taking the orchestra parts, entering them into the computer, and lots of trial and error I have found that using Notion with nTempo is absolutely a wonderful solution! Not a replacement in ANY WAY shape or form but I’d rather go live WITH these parts then to NOT have the parts! Neuratrons NotateMe used in conjunction with the PhotoScore in-app-purchase saved me a TON of time! I’ve found that using my iPhone X with NotateMe’s PhotoScore was WAY faster than using my original iPad Pro 12.9″ (I really wasn’t surprised that it was faster but I WAS surprised at HOW much faster it was!) Hands down, noticeable! Sometimes PhotoScore was NOT the fastest way! multi measure repeats are the first obvious item it misses. Another biggie was that sometimes it missed the key signature. Text ALWAYS had to be cleaned up. Notion – for iOS – Well worth having this on my iOS devices as well as my laptop! Has replaced my previous notation app. I always had to adjust the Show Attachments Above/Below to Auto. I also had to adjust Set Note Stem Direction to Auto. Step Entry Mode is Pretty stinking fast! Real Time Recording absolutely needs a quantize feature. Because of the lack of this feature I found it useless. LEARN YOUR KEY BOARD SHORTCUTS! Found out that entering Lyrics has a bug – it doesn’t always work in Continuous View Mode! Two – Enter Score Layout mode and drag the Part containing lyrics down lower in the score temporarily. For the entire first act I never touched my computer. I scanned all the string parts via my iPhoneX and then edited them all in Notion on my iPad. Then I switched to my computer. I think the computer is possibly a bit faster. I haven’t tried the full score on my iPad again, now that I am about done. I am wondering if the iPad can actually handle playing the full score. Using nTempo is pretty straight forward. start tapping and the music start to play and follows your tapping for tempo! iCloud sync in Notion is scary good! I never once had to manually transfer files between my iPhone/iPad/Laptop when I had wi-fi available. I used this app to store references to all the books that I did not want to carry with me. I am actually NOT using my iPad during the show because using the computer AND iPad is a bit much. I actually like the static reliability of having a two page paper score in front of me. That has been a pain though for simple things like quickly finding specific songs. I mean the full score is 202 pages LONG! As for the sounds coming from Notion – OUTSTANDING – I remember the day I’d have to create a score for the way I wanted things to look and then another for the way I wanted things to sound. With Notion, this is no longer the case! Dynamics, articulations, and the list goes on…. they ALL make the sounds you’d expect! It’s very nice! With the exception of swing… yeah… that’s a bit iffy still. It kind of works but there are adaptations you have to make. Like when you want one 8th note and then the next two tied. I’ve ended up putting WAY more parts into the computer than I anticipated because I decided that trying to be the nTempo tapper AND trying to read my paper score was impossible! I really needed to use simply the computer. Here are the parts I’ve put in that I never thought of before I started this process…. Piano Conductor – This is a piano part that actually get turned off in the mixer. It is there because even on a 15″ MacBook Pro screen I can not see all the parts. If I’m conducting I have to know what the heck I’m conducting. It is in effect a condensed score that lives at the top of my screen. The actors cue lines to know how the music lines up with the dialogue. Vocal Parts WITH lyrics – this helps immensely as I do NOT remember lyrics very well. It also helps to separate the vocal line from the instrumental parts. nTempo – I knew I’d have to enter beats. I didn’t really understand the intense pre-thought of how detailed this track would become. It’s WAY easier to just conduct – it comes second nature 🙂 I do wish I had the resources for all live musicians. You had better have a great sound system to make this work. First of all the sounds in Notion rock but if your speakers are bad… well…. You’ve got to have a good monitoring system so you and the live musicians can hear the track. and finally…. just like a real live instrument… YOU’D BETTER PRACTICE A TON! In January 2017 the Music Notation iOS app world grew. MusicJot by Mona Lisa Sound was one of those apps that actually has been released that works well. In January I did discover that there is another Music notation app being developed as well but that app is still in beta. I do find it very interesting that both of these music notation apps focus on using handwritten notation as a main method of input! John Reed (an arranger, cellist, and programmer) and Mark Dalrymple (a software developer as well as an accomplished trombonist and bassoonist) are the two main guys behind the development of MusicJot. The fact that they are both musicians themselves and the fact that John is a for real arranger for a Grammy nominated string quartet that was trained at Juliard, gives this app some much needed credibility! SO WHAT IS THE MAIN IDEA BEHIND MUSICJOT? The app store description gives the first few lines of description stating that MusicJot is a powerful music notation app that is easy to use by writing quickly and naturally on a staff. My description… HandWriting music notation on an iPad is an amazing experience. Technology gets out of the way, there is no more trying to figure out how to do something like find the correct tool set to create that time signature or articulation or change from inputting quarter notes to eighth notes. Simply draw the music, with articulations and markings, and it is quickly digitized! Before 2013 ThinkMusic had started a KickStarter to bring the first app to market that gave us handwritten music notation on a tablet. That campaign blew our minds with the possibility of what was to come but alas, the Kickstarter was never fully funded. But out of that came the MyScript engine that now powers Notion handwriting as well as MusicJot! WHAT DOES MUSICJOT OFFER THEN? The ability to handwrite music on a staff and have it turn into digital notation. Alternative palette-driven system for notes and music symbols. (You don’t have to hand write all the time. De-clutter what you see on the screen by using layers. Plus you can use the Virtual-Pointer to spot check and live audio scrub individual notes, chords or even the entire score. MusicJOT is completely customizable. From staff line weight to measure padding to beam angles to music spacing. Make your own house rules. Batch note manipulations, such as transpositions and copy/paste with merge, append and replace. Lyric support with automatic syllable flowing. and of course many of the other standard features that you would expect from a music notation app. There is of course the ability to export your music notation file as Music XML or MIDI. This becomes very important as many people may want to use MusicJot as a starting point, then import that file into Notion/Finale/Sibelius/Dorico on a desktop computer to finalize the project. It is also helpful that MusicJOT has a 10 step tutorial and a context sensitive reference manual. WHAT DOESN’T MUSICJOT OFFER THEN? While I fully believe in the ability to just simply write out music as if I was using paper I do believe that sometimes there are easier and faster methods of creating a music file. I would like to see a method for MIDI input form a keyboard. The layout currently is a bit simplistic in some ways – of course this could easily be seen as a benefit by some. To me it just seems to lack a bit of polish. It’s like when I am quickly building a database and just want to get it working, knowing that later I will come back to add that polished look to it. The app doesn’t look bad, just a bit basic. MusicJot is NOT an end to end solution in my eyes but then again I have NOT found that golden egg yet. The first problem is that there is not a desktop version of the app. The simple solution is to use XML to transfer to a desktop app. The problem is that I can not go back and forth between mobile and desktop in my continued work without constantly converting through XML which turns into a hassle! 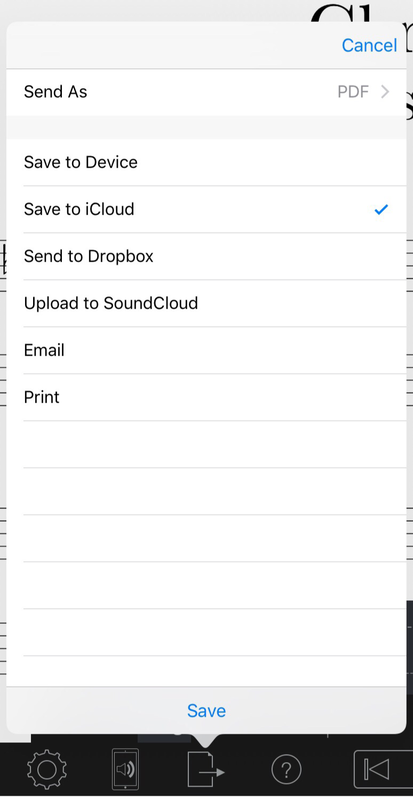 MusicJot is NOT the quickest way to edit existing music in my eyes – If I need a part altered for whatever reason I will still be grabbing NotateMe with the PhotoScore plugin. This allows me to snap a pic of exiting printed music, make a few edits and then have my new changes. Neuratron has been the king of music scanning for years and that has not changed with the advent of iPad. Coming soon will be features like Part Extraction and multiple voices per staff. 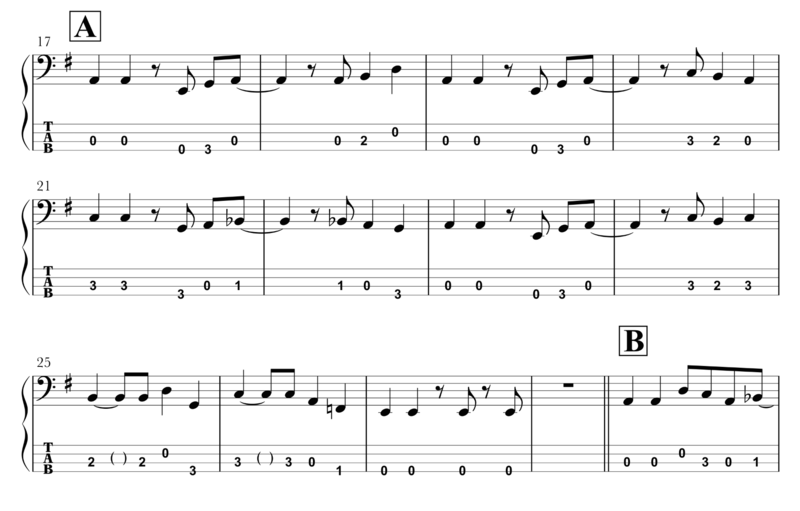 Also those of you who want guitar tab and chord diagrams will have to wait. Percussionists will also have to wait. Handwriting music notation on an iPad using any of these apps mentioned here is simply a wonderful and amazing thing. Handwriting music notation if you have an iPad Pro with the Apple Pencil is even more outstanding! I continue to convince music educators to spend a good deal of money in a matter of five minutes by simply demonstrating music notation apps to them. 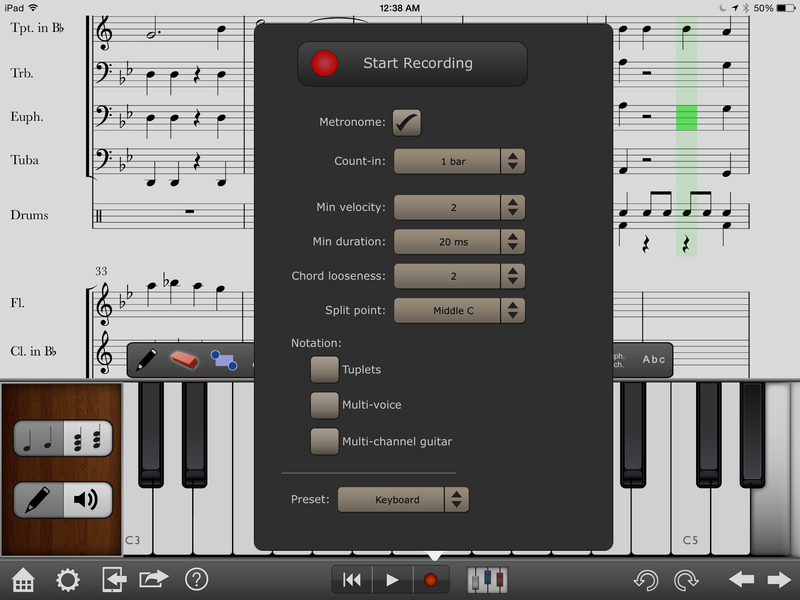 MusicJot brings some welcome features to iPad for music creation. 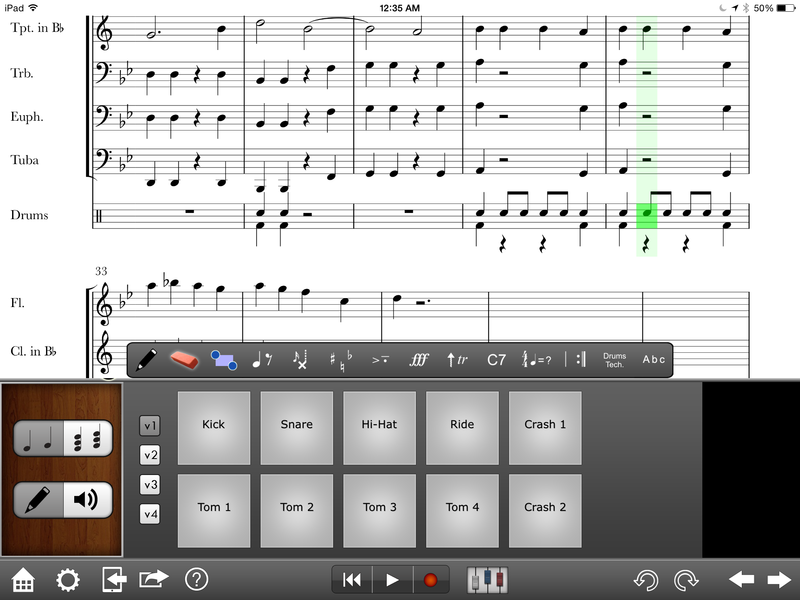 MusicJot has a some new twists and ideas that the other apps have not implemented yet. UPDATE -THE $29 PRICE TAG IS GOING TO STICK AROUND AS THE PRICE INSTEAD OF BEING JUST AN INTRO PRICE! With all this being said…. I think their idea of eventually raising the price to $50 is absurd considering the other options that are currently available at a lower cost. Leaving the price at $29 is quite possibly a decent price entrance. Compared to what is available on a windows tablet – StaffPad – $29 is an amazing price point. Compared to Notion on iPad with the handwriting IAP $29 is more. Considering costs of desktop apps in the past $29 is a steal! MusicJot works wonderfully and I look forward to the future development of the app! I appreciate the fact that the company gave me a promo code so that I could use and review the app here for you all to read about. Remember that links here on my website are affiliate links which when used by you to purchase apps I’ve reviewed, will give me 7% out of Apples profits while the developers continue to receive their full profits! Check out the spot MusicJot achieved on the Apple App Store – in the featured section under Perfect With Apple Pencil! It always is fun to see the look on somebodies face when I show them the magical things you can do with an iPad and music. For instance, handwriting music notation! It also amazes me how many do not even know that this is possible so I made a little video for you. Handwriting music notation seemed like a pipe dream a few years ago. One company promised the possibility and that app never came out. Then we had NotateMe and NotateMe Now arrive from Neuratron. Wow…. We could music the old fashioned way but it would magically turn into digital music notation! Of course Neuratron one upped themselves and soon released PhotoScore which allowed us to take a picture of sheet music then turn THAT into digital music notation! I’ve written about this already and that post still continues to be one of the most visited posts on my blog – read it here. Notion and its handwriting IAP is the reason I’m writing this blog post as well as sharing my little YouTube video with you. Notion realized this IAP a while back but now that I have an iPadPro 12.9″ and an Apple Pencil I wanted to share with you one more reason to invest in technology! I’ll make this short and sweet…. The experience of the larger screen combined with the absolute joy of using the Pencil makes handwriting music notation something that is fun, easy, effective and amazing. Watch the video if you have not seen this in action. The recognition is outstandingly accurate. I think this is about as fast as trying to use a MIDI keyboard now to enter notes. It just simply works. The Notion app itself is $14.99 and the hand writing plugin is $7.99 for a grand total of about $23. A price every music teacher should not even hesitate at. One word about my little video…. I used Explain Everything to create the video, annotate it and narrate it. Then I dumped it into iMovie where I dumped in my own audio soundtrack that I created using Cubasis and a few iPad synths. So one question I am trying to resolve for myself as my laptop quickly approaches its end of life is whether or not I really need a laptop any more…..but that is another blog post for another night! Well this weekend I decided to create four keyboard parts for my electronic group. I also decided that I was going to use Notion on my iPad to do that. I’ve come up with a few tips for you…. I worked WAY better in “Continuous View” which is strange because I kind of hate that view in Sibelius on a laptop. Part of learning if an app will work for you is to force yourself to just sit down and USE it exclusively! Don’t allow your self to go back to whatever you HAVE been using. Just bite the bullet and use the new app. It’s going to be frustrating but the more you have to dig for answers, the faster you will become better at it! Use the record feature if you can play the part from an external keyboard. It’s pretty darn accurate! turn off tuplets if you don’t need them though! Set your split point if working with a grand staff. Of course if you are entering drum parts there are four voice choices right there to the left of the drum pads. To grab the little blue handle you have to tap and wait a moment THEN drag! You HAVE to let go of the blue handle to move the screen over – you CANNOT drag the handles and expect the screen to scroll at the same time. After moving the screen over wait for it to stop moving BEFORE grabbing the blue handle again. Then tap, wait a moment and drag your selection out further. When the entire passage is selected make sure to select the option you need (Cut, Copy, Paste, Delete, Clear etc…) BEFORE moving the screen back! Otherwise you are going to end up repeating this entire process AGAIN! Add all rehearsal marks at the same time – just makes it easier then jumping back and forth between tools. Good grief I wish there was a way to have those rehearsal marks be the measure number by default! Add all your dynamics at the same time – just makes it easier then jumping back and forth between tools. When inserting dynamics the spot you want the dynamic to be inserted can be Green OR Orange either one unlike when dealing with Rehearsals marks as noted above! Yeah…. can’t find them? Select a measure and you will! Pretty slick eh? For instance you will NOT be able to add a decrescendo in a piano part underneath a whole note. Please oh please add a title for pages 2, 3, 4 on to the end of the piece! Please add the Part Name to each part you print. Play around with the notation size and margins until you get just the right look for you parts BEFORE you print them! SAVE A TREE! There isn’t a piano reduction tool in Notion yet so don’t bother looking for it! If you have some tips for using Notion on iPad I’d love to add them to my list here! Most teachers use their summer time as a chance to rejuvenate and relax while at the same time planning and preparing for the upcoming school year. As a music teacher who likes to take advantage of the technology available to us today, I am deep into the prep work for my fall Marching Band Show. Currently I am working on the music. I wanted to share some of that process because the tools we have available to us are exciting. These tools open doors to new ways to teach, assess and improve our students/ourselves. CURRENT PROJECT: My end outcome is that I want my marching band students to use SmartMusic to record playing assessments. This allows me a chance to hear each and every individual student, give them feedback to improve as an individual and then I also use those assessments to hone in on issues to work on with the full group. THE PROBLEM: SmartMusic has an extensive repertoire for band students but my marching band music is not included in that list. THE SOLUTION: Thankfully MakeMusic allows us to use Finale to create our own SmartMusic assessments. THE PROCESS: Of course that means that we have to take each instrumental part and get it into Finale in the first place. Because Finale and I do not get along – I have other programs that allow me to work much faster – I utilize the XML file format. XML allows me to work with other music notation programs to create the digital sheet music that will then smoothly import into Finale which will translate that into SmartMusic. As complicated as this process sounds it really is so much easier these days! In fact, much of the work can now be done using simply an iPad allowing me to work wherever I want to. I do not have to be sitting at my desk at my house or God forbid, the school! So here it all is…. STEP ONE: Using my iPad I scan each part into NotateMe working with the PhotoScore plugin. Neuratron has just updated the desktop version of PhotoScore to version 8 so this process can also be done using a regular computer. I’ve not yet figured out which is fastest, the computer or the iPad. Each works so darned well now that I think you are going to win no matter which way you go! STEP TWO: Using NotateMe on my iPad I go through and carefully check for the following items – Time Signatures, Key signatures, Multi-measure Rests and then notation issues. If any of these, which I call the Big Four, are messed up then trying to import the NotateMe XML into another music notation app is going to be more work. Honestly, I don’t even worry that much about articulations, dynamics and for sure NEVER worry about markings such as rehearsal letters, tempo or style. Those items are faster most times to fix later in another app once all parts are imported. STEP THREE: I then take advantage of NotateMe’s XML export feature to dump the now digital sheet music into Notion on my iPad. STEP FOUR: I double check that all is good once I open the music in Notion. Again I check the big four – I often find I missed something in NotateMe like a key signature change. Sometimes I find that measures of rests did not all import correctly. STEP FIVE: If it is a transposing instrument I then transpose the part to concert key and then select the entire part and copy it. STEP SIX: Then it is time to open the full score and paste in the individual part. You really must pay attention because if you missed one of those big four items in the above steps then when you paste in the new music EVERY SINGLE STAVE is changed and is now WRONG! Time signatures will be in the wrong spot, key signatures will be messed up etc… In fact – if you messed up the measures it is absurdly hard to fix it after pasting into the full score. I will just undo the paste, exit out of the score and go back to the individual part to fix any of the big four issues. STEP SEVEN: Importing from NotateMe into Notion using the XML format messes with positioning of dynamics so you have to select the entire Notion score, tap the more option, tap the attachments option and select the auto position. STEP EIGHT: I now go through the entire score to figure out where I have missing dynamic issues, to input rehearsal letters/numbers, set correct tempos and any other final details. STEP NINE: Then I export the score out of Notion as an XML file, Import that into Finale and save it as a SmartMusic file. STEP ELEVEN: Listen to the playing tests and give immediate feedback! I’ve recorded this process in a nifty YouTube video for you to see the process of taking the scanned NotateMe music and importing it into your score. That is the part that takes a little bit of thinking so I figured a video may help some of you. If you have questions please contact me and I will see where I can help. 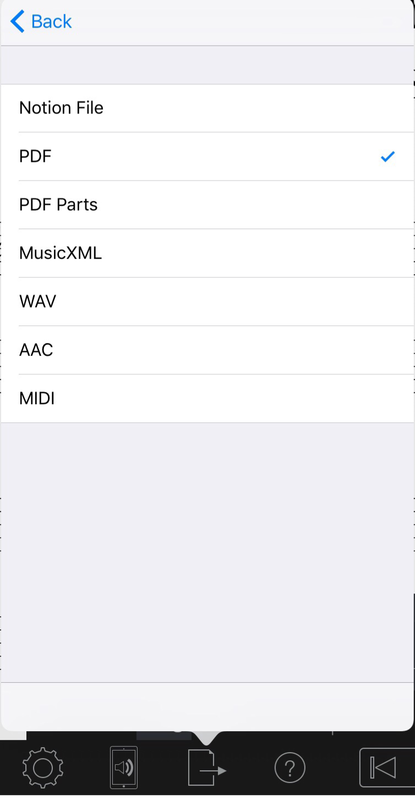 Music XML – Can’t download this as it is built into various apps like Notion and Finale. It is owned by Make Music though. Ever run into the scenario where you pull out a piece of music that you really want to perform for your next concert only to find out that the keyboard part has been lost? Ever have a budding young bass guitarist who is learning how to read notes and play that bass but you know that if you handed her tabs to go along with the notation things would go a whole lot faster in rehearsal? My answers: Yup and Yup! My response: Use a couple of apps, my iPad and an external MIDI Keyboard along with my Camera Connection Kit and an hour or so later I have the problem solved! I took the actual paper copy of the bass part to the piece of music, used the outstanding app NotateMe along with the PhotoScore plugin and took a picture on my iPhone of the bass part. 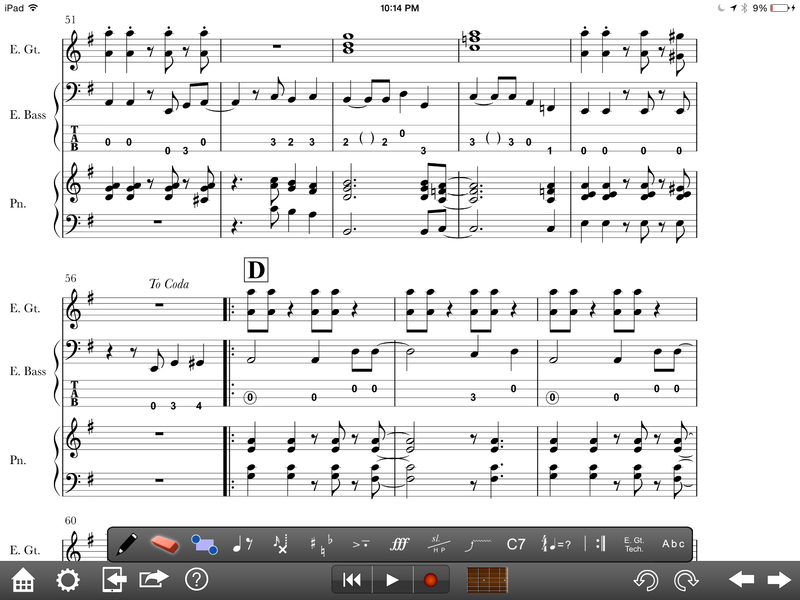 NotateMe and the PhotoScore plugin turned that picture of the sheet music into digital notation. Using my iPhone and my finger I cleaned up and fixed a few small errors. Then I exported that as an XML file into Notion for iPad. Notion is a full featured music notation app for iPad as well as desktop computers. I did the same for the guitar part just for the fun of it because it is so stinking fast and easy to do! Here is what the Bass guitar part looked like after I imported it into Notion and set the instrument as a Bass Guitar (Notion automatically had the TAB turned on for me already but it is a quick tap of a button to turn off as you will that I did for the Guitar part) Now I’ve got my bassist taken care of. On to the lost Keyboard part – for this I hooked up my Camera Connection Kit to my Novation LaunchKey. The LaunchKey is bus powered by the iPad so I didn’t have to worry about additional power cords or batteries. Then in Notion I added a piano part, tapped on the first measure, and then the record button. Then I played the right hand in real time while Notion (on an iPad mind you!) recorded it. During recording you get these little blue lines but as soon as you hit the stop button those blue lines get turned into music notation! I have come to discover that doing this on an iPad is giving me just results that are just as excellent as on a laptop! Then I repeated and recorded the left hand. While recording the left hand I set the split point so that it wouldn’t mess up the RH part. I had a couple of weird errors afterwards so I fixed those quickly by tapping and selecting and erasing and changing – easy and quick! After all that this is my score I ended up with on the iPad… You can see that it looks fantabulous! The last and final step was to hit the share/export button, elect Export PDF, select Individual Parts and then Email. I sent myself a copy to print in the morning and I also sent my bassist a copy of her new sheet music that now included the TABs. If you have NOT used NotateMe you really must! There is even a totally free version of the app called NotateMe Now that allows you to experience the PhotoScore plugin as well FOR FREE – the limitation is that it only works with one stave parts. So a trumpet part could be scanned in but a piano part could not. 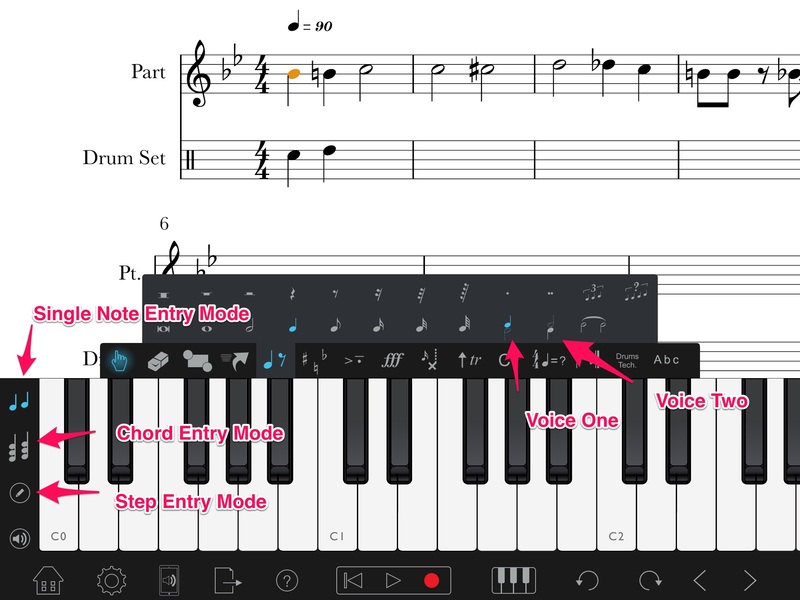 Notion on iPad – Music Notation Rocks on iPad! I’ve got to say that entering music notation scores and editing them on an iPad is a very enjoyable feat these days! Notion ($15) makes things so extremely easy with the touch interface! If you have NOT purchased Notion for your iPad you are crazy! I have no idea what in the world you are waiting for! In fact, using the on screen keyboard to enter notes using the record function actually ends up working better many times than doing it on the laptop! Drum notation is so much easier too using their drum pads to enter the notes in. I used to dread clicking on the correct space or line with a mouse – now I just select voice on or two and then tap the pad for which ever instrument I want! Easy as pie! Th sound is amazing as well when we play the score back! Notion is not without issues – it drives me crazy having to transpose in my head to get all the instrumental parts entered correctly! Also, there are still issues with page layouts. I just can not believe this is even possible though on an iPad all for $15! There are more and more reasons to love using an iPad as a musician! One of those is the fact that we now have full featured music notation apps available! One such app is Notion from PreSonus Music. It is for several reasons that I have purchased Notion on both my iPad as well as my laptop. Now the journey has been to learn the in’s and out’s of both apps! Using Notion feels very familiar in so many ways, in fact Notion is even easier sometimes then wha tI have used in the past! I really like inputting articulations for instance – it’s a breeze! Sometimes I run into problems figuring the new methods out though. Thank goodness for Twitter and Notions quick and helpful response! To Whom ever is on the other end of that Twitter account – THANK YOU FOR BEING HELPFUL AND RESPONSIVE! Here is the issue I had today – My score had rhythmic issues in it. I had 16th notes for instance that I needed to be changed into 8th notes. I was on my laptop at the time. What I tried was to select the 16th note then click on the 8th note tool in the tool bar – I figured it would a quick fix. Well, it did not work! Eventually I decided the best way to change the 16th notes was to click on the 8th note tool (or simply type the short cut – e) then I went and clicked on each of the 16th notes in the score that I wanted to have changed. As long as I clicked right on top of the old note this worked, each 16th was changed to an 8th. This process created problem #2 though – I kept missing that darn note head and so I would end up with an extra note that I then had to delete! Then I found that if I selected the notes I wanted to have changed, then typed the = key followed by e then all the notes I had selected would then be changed to 8th notes. This of course then left me with problem #3 though – Now I had measures with the wrong number of counts in them! So I grabbed my iPad, fired up Notion and tried changing note values on the iPad…. Strange thing was that on iPad, if I tapped on the 16th note that I wanted changed to an 8th and then tapped the 8th note in the tool bar the value changed as I expected it to! I guess this is just the difference between working with a touch screen. 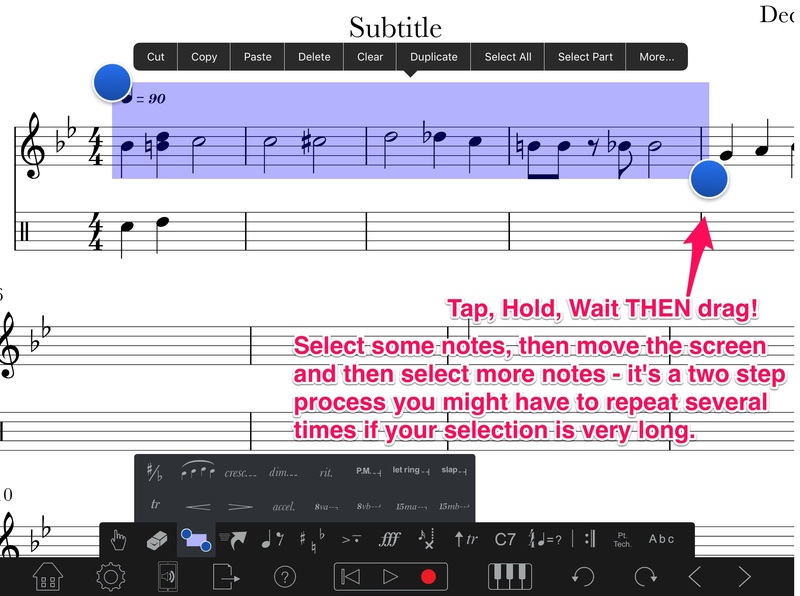 What I could not ever figure out on the iPad was how to change more than one note at a time (problem #4) This really wasn’t an issue though as on iPad it is so fast to select a note and then change the value – it just seems faster to tap, change then on the desktop. So…. in hopes that I help someone else figure out how to do this this the correct way I post this blog post. I also made a video so you can see what I mean – it’s a bit difficult to explain.